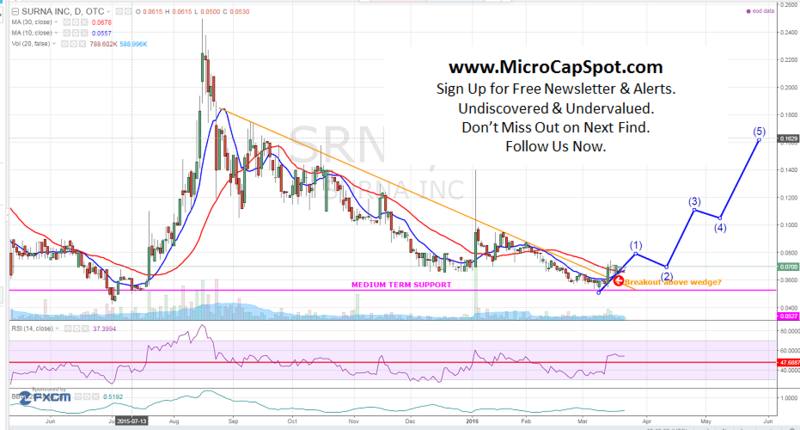 Surna Inc (OTCMKTS:SRNA) investors has pushed shares higher on recent developments and announcements by the company. The stock has advanced over 40% in the last few trading days and may have more gains in store. SRNA posted gains of over 19% today on above daily average volume with almost 400,000 shares trading hands. In recent developments, Surna Inc (OTCMKTS:SRNA) has spent the last three years building out its technology platform and has been acquiring customers. The company has spent less than $2,000,000 which was gathered from its 10-Q SEC filing. Many micro-cap companies raise toxic financing and pay exorbitant salaries, the Company owes on just one $35,000 bank loan, holds more than $120,000 in cash, and has averaged a monthly cash burn rate of just $60,000. The company disclosed potential sales pipeline of $5M and disclosed that the projects have commenced which means revenues have started to be recognized. SRNA has also added to its C-Suite hiring a Chief Financial Officer. Ellen White has taken the top spot in finance previously serving as director of finance for the company. Ms. White brings more than 20 years of financial and accounting experience including time at both large public companies and small startups. Her prior experience includes CFO at the National Sports Center for the Disabled (NSCD), where her responsibilities included treasury and cash management, controllership, human resources, risk management, planning, budgeting, forecasting, strategy and Board of Directors interaction. This should be exciting news in itself for investors. She could be making a large salary at any large corporation but she has chosen to stay on board with SRNA. Unless there was significant opportunity, she would have left long ago. In other announcements, SRNA has secured $725,000 contract with indoor Cannabis Grower Cloud 9 Wholesale. The company will provide their proprietary climate control technology to the cultivation facility for the single-phase project. The Cloud 9 Wholesale facility covers 30,000 square feet, which will require approximately 550 tons of cooling equipment for cultivation climate control. Surna Inc. is a technology company that designs, manufactures, and distributes state-of-the-art systems for controlled environment agriculture (“CEA”). Its products offer growers improved process control while simultaneously reducing the energy and resources required to maximize crop yield. Currently, the Company’s revenues derive largely from supplying industrial-grade technology to state-regulated cannabis cultivation facilities with nominal revenue as well from other indoor agricultural producers including organic herb and vegetable producers. Ultimately, it plans to provide full-scale, energy-efficient solutions for all aspects of a CEA facility. SRNA is currently trading at a $9 million market valuation. The company has made several new developments that are exciting but still flying under the radar. Stay tuned for more details as we profile the company more. We will be updating on SRNA when more details emerge so make sure you are subscribed to Microcapspot so you know what’s going on with SRNA. Disclosure: we hold no position in SRNA either long or short at the publication of this article and we have not been compensated for this article.